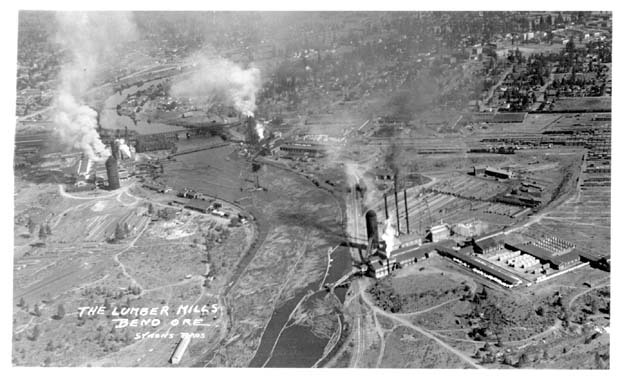 An aerial view of the two large sawmills in Bend in 1937. The Shevlin-Hixon mill in on the left side of this photograph, with the sprawling Brooks-Scanlon mill across the river to the right. Downtown Bend lies behind the mills. Photo is from the Martin Moriesette collection. The Shevlin-Hixon Lumber Company had its roots in Minnesota when the Shevlin family combined forces with a banker from Wisconsin named Frank P. Hixon. The Shevlin family owned extensive timberlands in Minnesota and Oregon, and the capital that Hixon brought into the combination allowed the company to prosper. Mr. Hixon became president of the company, and T. A. McCann, a cousin of the Shevlins, became manager of their western operations. The Shevlin-Hixon company acquired substantial holdings in Deschutes, Klamath and Lake Counties in central Oregon, containing well over two billion board feet of standing timber. The completion of the joint Oregon Trunk/Des Chutes railroad into Bend from the north in 1911 provided the transportation to distant markets that was needed to start large-scale commercial timber operations. Actual construction of the sawmill did not start until 1915, when ground was broken just south of Bend on the west bank of the Deschutes River. Work on a railroad to bring logs to the mill was also started, and it ensured that a supply of timber was on hand for the startup of sawmilling activities on 3 March 1916. The sawmill was served by a branchline of the Oregon Trunk that crossed the Deschutes River on a bridge built jointly by the lumber company and the railroad company. 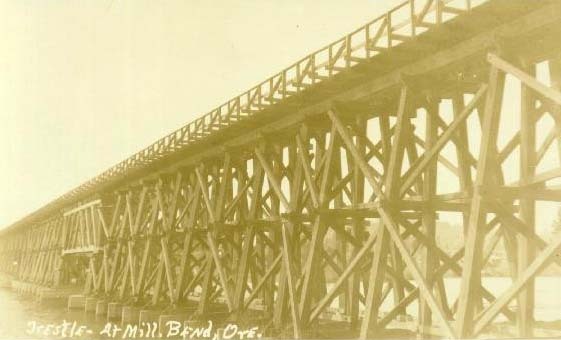 The Oregon Trunk had aspirations to build a line south of Bend, and the bridge was intended to be part of the first segment of that line. The bridge over the Deschutes River that provided rail access to the Shevlin-Hixon Mill. Marc Reusser collection. Initial harvest operations were centered in the hills west of Bend until the timber in that area was exhausted. Harvest operations then started their march south, with the mainline of the railroad by 1922 running six or seven miles south along the west bank of the Deschutes River to Benham Falls, where a bridge was built to carry the line to the east bank of the river. A river-to-rail transload facility was built just south of the falls, where logs floated down the river from harvest operations farther up would be removed from the water and loaded onto railcars for shipment to the mill. By late 1926 the end of track was in the La Pine area, and a spider web of grades had been built in the country between the town and Paulina Lake. At this point the mighty Great Northern entered the picture, as it finally received permission to build its long-sought line south from Bend to Klamath Falls. The S-H logging railroad lay directly in the path of the contemplated construction, and the GN saw it as a means to reduce the amount of initial construction required to build their new line. The result was that the GN purchased a 75 percent stake in the S-H �mainline� between Bend and La Pine, with S-H retaining the other 25 percent. S-H retained the right to operate log trains over the GN mainline to Bend, with the stipulation that all movements were controlled by the GN and that S-H trains and crews must operate under GN rules. The first GN train ran from Bend to La Pine on 8 September 1927, and construction of the GN line south from La Pine to a connection with the Southern Pacific line at Chemult started shortly thereafter. The line was completed on 8 March 1928, and GN commenced offering through service to Klamath Falls the following May. By this point Shevlin-Hixon owned more than 70,000 acres of prime timber in northern Klamath County, and many businessmen in Klamath Falls hoped that S-H would relocate their sawmill to their city to harvest this timber. Rumors were rampant for a few years, but gradually died away. Except for some timber harvested and milled by a closely affiliated company that was located in Klamath County, logs harvested off of S-H lands went north to Bend. 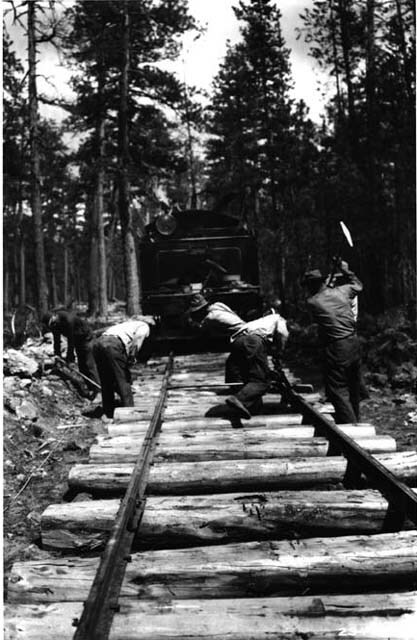 A Shevlin-Hixon track crew laying out a spur line south of Bend. U.S. Forest Service collection. By 1942 S-H harvest operations were in northern Klamath County, with a connection established on the GN main line at Freemont Siding, about seven miles due east of Gilchrist. This line extended about sixteen miles east to Big Hole, with several branches built off of this line. By 1947 operations were moved even farther south, to Chemult. The actual camp was set up approximately 18 miles southeast of Chemult, and the closest point on the mainline was Diamond Lake siding, which was on the joint GN-SP line about four miles south of Chemult. However, connecting the logging railroad to the mainline at that point would have required obtaining trackage rights over the busy SP mainline into Chemult, so to avoid this problem S-H built four miles of railroad parallel to the SP line, and a connection was established with the Great Northern at the southern end of their trackage just north of the junction between the SP and GN lines. By the late 1940�s it was apparent to both Shevlin-Hixon and Brooks-Scanlon, which also had a huge sawmill in Bend located directly across the river from the S-H mill, that insufficient timber remained in the area that the two mills drew their timber from to sustain operations of both mills for much longer. Local governmental organizations and the U.S. Forest Service had expressed concerns that the two sawmills in Bend were cutting timber at an unsustainable rate for years. The Forest Service had reached this conclusion as early as 1925; a Committee of Sustained Yield Timber Operations established by the Chamber of Commerce in Bend in 1937 concluded that total potential combined output of the two sawmills in Bend was approximately 400 million board feet annually, while the surrounding forests were only capable of providing 100 million board feet annually on a sustained yield basis. By 1944 the figured sustained yield of the forests was downgraded to only 82 million board feet per year. Clearly the sawmills were rapidly running out of trees to cut, and something had to be done to correct the problem before it became more of a crisis. The end result was that Shevlin-Hixon elected to sell out to Brooks-Scanlon. The transaction became effective in November 1950, and the S-H sawmill was promptly closed, with the last load of lumber shipped from the facility leaving four months later. The end of an era was at hand. Brooks-Scanlon continued to run the old Shevlin-Hixon logging railroad operation basically as it found it, with the only real change being that the logs were shipped to the B-S mill. Only one S-H locomotive was re-lettered to reflect the new ownership. Coverage of the logging railroad operations after the B-S takeover can be found on the Brooks-Scanlon page of this website. Very little is left to mark the operations that Shevlin-Hixon carried on for thirty five years in central Oregon. Miles of roadbeds can still be found in the woods to the south of Bend, but recent development has obliterated the old mill site in Bend. Those employees that could stay on with B-S did, but many more were forced to leave, with at least some traveling south to take jobs with the McCloud River Lumber Company operations in McCloud, CA, which had been closely affiliated with Shevlin-Hixon for many years prior to the closure of the Bend mill. Perhaps the biggest impact of the closure of Shevlin-Hixon was that harvest levels in central Oregon were finally brought back more in line with what the forests could sustain, and the Brooks-Scanlon mill was kept in operation in Bend for another forty or so years before finally closing down. Today Bend is one of the fastest growing cities in the state of Oregon, and it has left much of its timber heritage behind. The forests logged off by Shevlin-Hixon have grown back into new forests, and the current residents are more inclined to let these �virgin� forests stand than those who came before. A map of the approximate location of the major railroad lines constructed by the Shevlin- Hixon Lumber Company. The reader is referred to Railroad Logging in the Klamath Country by Jack Bowden for a more comprehensive map of lines built by this company. #1- Lima 3-Truck Shay, c/n 2821, blt 1915. Cylinders 11�x12�, drivers 32�, weight 59 tons, tractive effort 25,380 lbs. Purchased new. To Zimmerman, Wells Brown & Company, Portland, OR; to National Lumber & Mfg. Company, Hoquiam, WA; to Schafer Brothers Logging Company #12, Brady, WA; to Mullinix Brothers Logging Company #12, Pe Ell, WA, 1938. #2- Baldwin 2-8-2, c/n 43210, blt 4/1916. Cylinders 18�x24�, drivers 44�, boiler pressure 180 lbs, weight 139,000 lbs., tractive effort 27,000 lbs. Purchased new. To Brooks-Scanlon 1950, but never re-lettered or re-numbered. Scrapped. #3- Lima 3-Truck Shay, c/n 2941, blt 1917. Cyliners 12:x15�, drivers 36�, weight 75 tons, tractive effort 30,350 lbs. Purchased new. To Eagle Lumber Company, Westimber, OR; to C.H. Wheeler Company, Cochran, OR; to Blue Lake Logging Company, Cochran, OR, 1928; to Columbia Contract Company, Astoria, OR, 1932; Scrapped 1953. #4- Baldwin 2-8-2, c/n 51907, blt 6/1919. Cylinders 18�x24�, drivers 48�, boiler pressure 170 lbs., weight 175,500 lbs, tractive effort 35,400 lbs. Purchased new. To Brooks-Scanlon 1950, only ex-Shevlin-Hixon locomotive re-lettered to reflect new ownership. Re-numbered �S-H 4� by B-S to avoid duplication with B-S�s own #4. Scrapped. #5- Baldwin 2-8-2, c/n 55805, blt 11/1922. Cylinders 18�x24�, drivers 44�, boiler pressure 185 lbs, weight 143,000 lbs, tractive effort 27,800 lbs. Purchase new. To Brooks-Scanlon 1950, but never re-lettered or re-numbered. Scrapped. #6- Baldwin 2-8-2, c/n #56111, blt 2/1923. Cylinders 18�x24�, drivers 44:, boiler pressure 185 lbs., weight 143,000 lbs., tractive effort 27,800 lbs. Purchased new. To Brooks-Scanlon 1950, but never re-lettered or re-numbered. Scrapped. #7- Baldwin 2-8-2, c/n 53251, blt 5/1920. Cylinders 19�x24�, drivers 42�, boiler pressure 185 lbs., tractive effort 32,500 lbs. Built as a 2-8-2T (square-rectangular water tanks mounted along the boiler, instead of the typical over the boiler arrangement) for Wisconsin Logging & Timber Company #7; to Shevlin-Hixon #7. S-H removed the water tanks and added a tender . To Brooks-Scanlon 1950, but never re-lettered or re-numbered. Scrapped. #8- Baldwin 2-8-2, c/n 57708, blt 4/1924. Cylinders 20.5�x28�, drivers 48�, boiler pressure 170 lbs., weight 88 tons, tractive effort 35,400 lbs. Purchased new. To Brooks-Scanlon 1950, but never re-lettered or re-numbered. Scrapped.